Low back pain (LBP) is a prevalent and expensive condition that affects all age groups. It is estimated that up to 90% of the population will have LBP at some point in their lives, and the recent global burden of disease study demonstrated that LBP is the most significant contributor to years lived with disability in Europe. Direct costs have been estimated in one study as 1.6-3.2% of all health expenditure. Indirect costs, which are largely due to work absence, have been estimated as $11 billion in the UK. Recent published guidelines for the management of non-specific LBP have self-management at their cornerstone, with patients being advised against bed rest, and advised to remain active, remain at work where possible, and to perform stretching and strengthening exercises, as well as avoiding long periods of inactivity. However, adherence to self-management is challenging due to lack of monitoring and feedback. SELFBACK is an EU funded Horizon 2020 project to develop a monitoring system to assist the patients in deciding and reinforcing appropriate physical activity and exercise plans in order to self-mange LBP. The system continuously monitors users’ physical activity and sleep using a wristband. This information is combined with user-reported pain levels and functional ability to recommend a personalised self-management plan for the user. 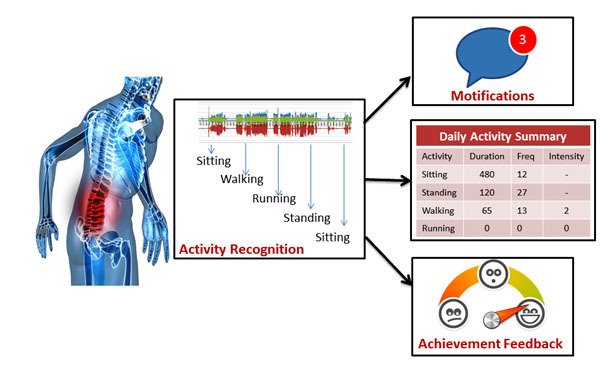 Plan achievement is automatically tracked and poor adherence results in motivational notifications (motifications) being triggered to encourage behavioural change.